Thanks, Mail Carrier | Ring in March with a Sale on Disney Publishing Apps for iOS! Ring in March with a Sale on Disney Publishing Apps for iOS! For some people, the arrival of March means anything and everything basketball. Just can't beat March Madness and rooting on your favorite team, right? However, for my girls (who aren't really all that interested in "Daddy TV"), they are much more excited about the "App Madness" currently going on with some of the most popular Disney Publishing apps for iOS! In this action-packed adventure that follows the theme of Toy Story 2, Woody gets toy-napped when Andy goes to Cowboy Camp. Buzz Lightyear and the other toys set out to rescue their friend before he is shipped off to a museum in Japan while Woody learns all about his past and makes new friends that are sure to last a lifetime. Colorful animations and surprise features fill each page, while there is so much more to this app than simply a reading of the story. Users can choose from games, movie clips, coloring pages, music and can even record their own voice and listen to themselves narrating this lovable tale! 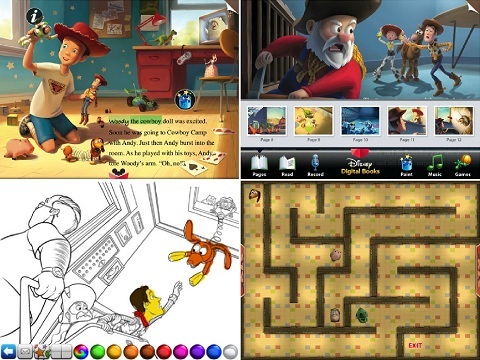 This cinematic, interactive storybook app features characters from Toy Story 3. As with the Toy Story 2 Read-Along app, the adventures of everyone's favorite Woody and Buzz (and more) can be read aloud or explored at the child's own pace (with the option to record their own voice) as well. Children can play exciting games based on scenes from the film, such as watching Woody soar above the town and help him to safety in "Hang Glider." Or maybe they want to have a blast with Buzz as they overcome thrilling obstacles in "Falling with Style!" 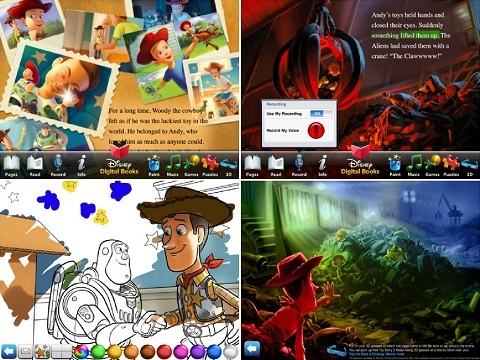 Along with finger painting and the ability to sing along to your favorite Toy Story 3 songs, this app allows kids to view pages using fantastic 3D effects that have dynamic touch-to-play exploration. Simply tap the "blinking stars" whenever they are seen to reveal animated surprises throughout the app! Who doesn't love Walt Disney's "it’s a small world" ride? This animated app takes readers on a world-class adventure packed with whimsical interactivity, beautiful artwork, and unforgettable music. 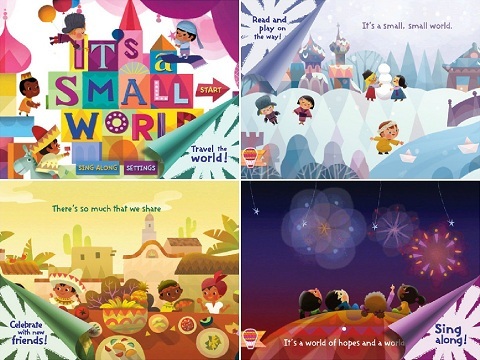 Featuring the original Sherman Brothers' song lyrics, this simple, poetic story encourages kids to meet new people, explore new places, and discover that it's a small world, after all. Kids will span the globe, traveling over snowy Russian hilltops, across sunny African plains, and through deep ocean waters. Rich, surprising interactivity brings each new destination to life. Plus, a special sing-along feature lets kids join in the musical celebration! If you have a Disney fan at home, take advantage of this sale as a unique and fun way to surprise them with stories, games and entertainment to kick off the month of March. But remember, these apps are $1.99 only until Monday, March 4th and then they'll go back to their regular price, so don't miss out! I was provided complimentary downloads of these apps, however, all thoughts and opinions are honest and my own. The Toy Story 2 one looks pretty cute! I love read aloud books. i just love Disney ANYTHING!!! These would be great if I had a device that could use them. I'll tell my sister about this. My nephew would love them. My Son loves the Disney Toy Story read along books for his iPad, thanks so much for posting this information! I downloaded both Toy Story 2 and Toy Story 3 Read along books for him, and he enjoyed both of them! I'll have to download some of these. My niece and nephew love playing with the Disney apps on my iPad.